Virtually unknown just a few years ago, gamification is fast emerging as a user engagement and behaviour change tool that succeeds where other tactics and strategies have failed. It's the new "business tech trend to watch", and is already being tested in a diverse range of sectors.Not only useful for strengthening communication and engagement and as a potent behaviour change agent, it is also being advocated as a uniquely effective tool for stimulating innovative thinking and new ideas. 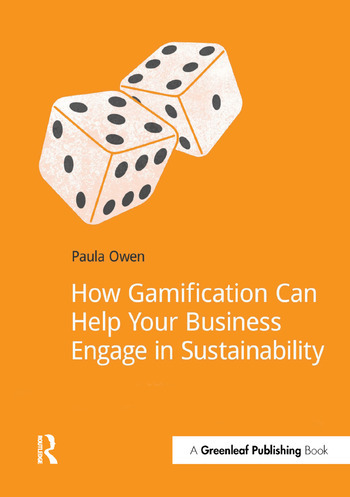 In the environmental sector, "eco-gamification" is showing early promise in sustainable transport, employee engagement, energy and recycling, and its potential for other sectors is clear.This book contains all the information businesses and other organizations need to make an informed decision about whether to adopt gamification as part of their own business and sustainability strategies – and the tools to get started. Owen's expert investigation outlines the latest theory, tactics and strategies, draws together emerging best practice and points to stand-out successes in the health and fitness, medical research, and financial sectors, as well as early successes in "eco-gamification".Whether the people you are engaging are customers, citizens, employees, shareholders, executives or board members, if you're an organization concerned with enhancing environmental sustainability, and you want your efforts to make a real and lasting difference, this book is for you. 1. Introducing gamification: A flash in the pan or the next big thing?2. Elements of the theory: The Lego set of gamification3. Gamification for sustainability: Can ‘fun and games’ really save the planet?4. Eco-gamification in business: How is it playing out?5. Conclusion: Are you game?